This order is the one by which I measure all my following client interactions. A few months ago I took on a commission for a custom ketubah from the best couple. They were so sweet! The impact they've had on my studio in the relatively short time we were in contact resonates with me to this day and beyond. I was just getting started taking orders for ketubot, and certainly I've never taken a custom order of this scale before, so my confidence was still as shaky as a newborn foal. Through their kindness and patience I learned a quality of spirit I hadn't realized I was missing until then. 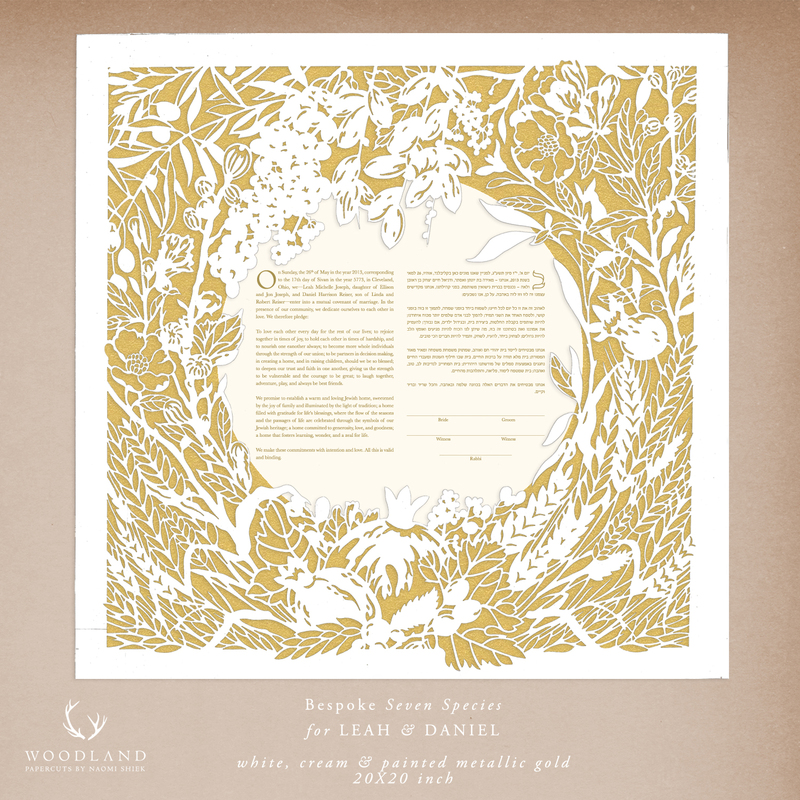 Daniel & Leah wanted a great big ketubah featuring the Seven Species (wheat, barley, grape, fig, pomegranate, olive, and date). The 20X20 inches big papercut was paired with a hand-painted metallic gold background and color text printed on cream paper. 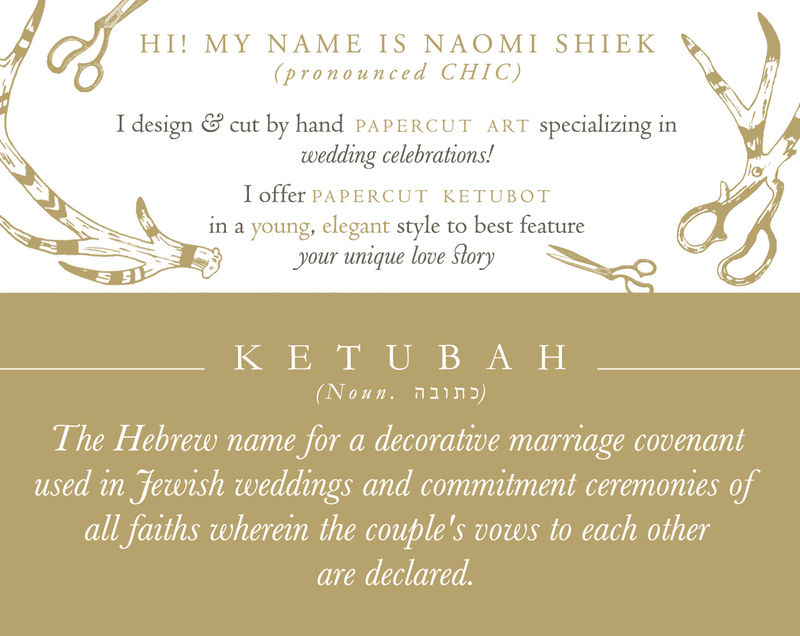 Two additional mini versions of the ketubah, with the sweetest personal thank you letters written by Leah & Daniel, were made for the couple's parents as well. 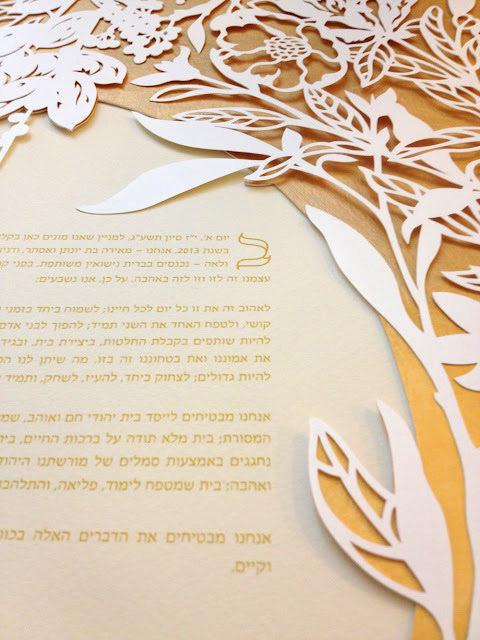 The couple's vision for their ketubah was quite clear, though it did go through a few minor changes until I got it just right. They were awesome and gave me lots of feedback. The whole process took just over three months, including the month they had to wait until I had an opening and could start drawing (usually I'm booked 1-1.5 months ahead). In case you were wondering, this is how I send a sketch to clients to show them how their ketubah will look. 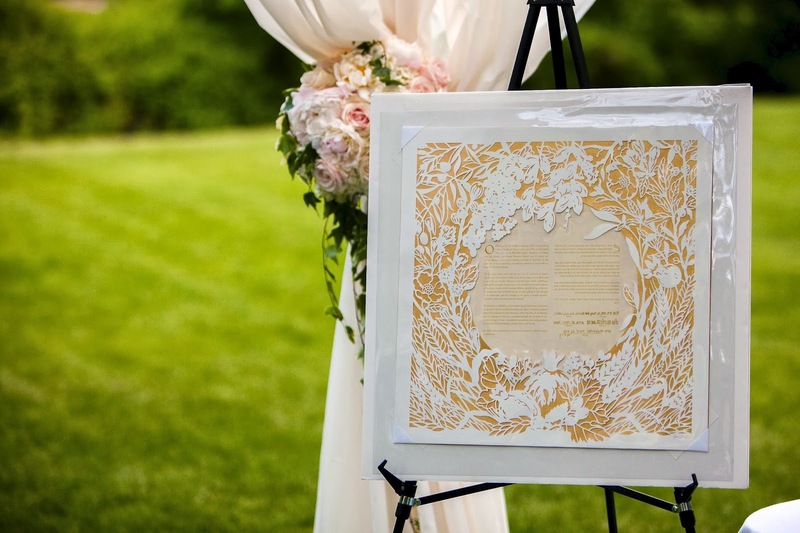 Being a terrible photographer I of course only managed to squeeze out a few closeup shots of the finished ketubah and no full image - but Leah was kind enough to send me these beautiful photos taken by her photographer on the day of! 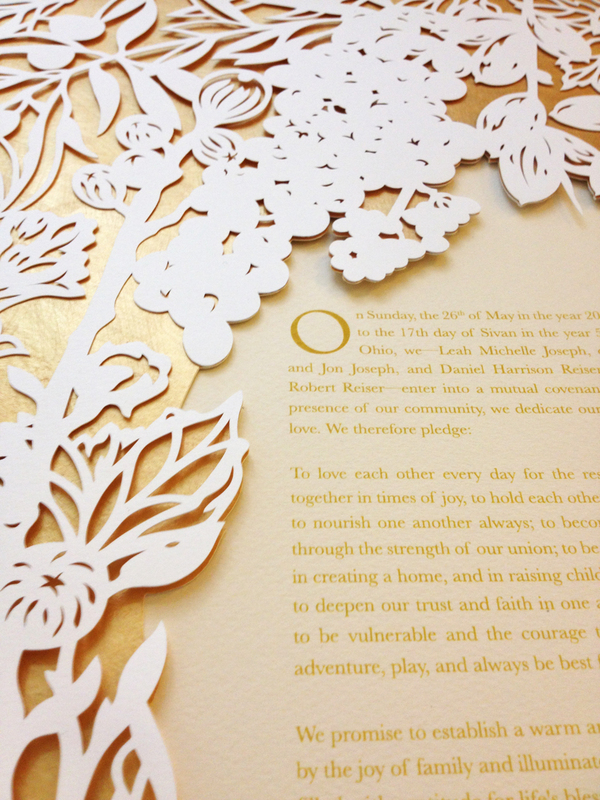 This ketubah really got close to my heart, or rather Leah & Daniel did. During our correspondence they included a link to their WEDDING WEBSITE, and that's when I realized I'm a soft, cuddly romantic. I dare you to browse it and not get emotional! I usually play romance movies like Love Actually and Pride & Prejudice when drawing papercuts (I keep the action classics like Die Hard and Lethal Weapon for when I'm papercutting), but this time thanks to the clients' great taste in music I had a great soundtrack from their personal website to accompany me through the nights. And yes, the music is playing now as I type this! 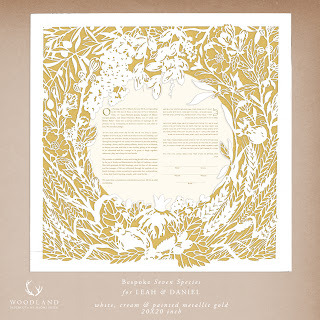 Leah & Daniel Reiser's Seven Species ketubah is one of the designs that's referenced the most when clients described their perfect ketubah. Their friends as well as casual online browsers have had nothing but kind things to say about it - and thankfully Leah & Daniel have too! 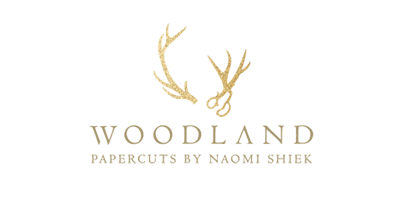 Naomi Shiek of Woodland Papercuts is nothing short of magnificent. Not only is her work exquisite but she is an absolute joy to work with. 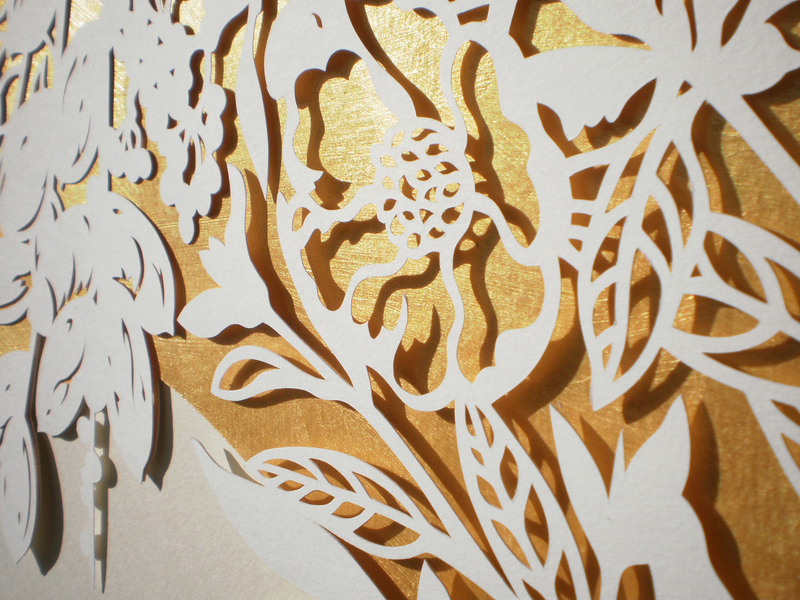 The thought and care she puts into every design element from initial sketch to final cutting and painting shines as an example of true and generous artistry. 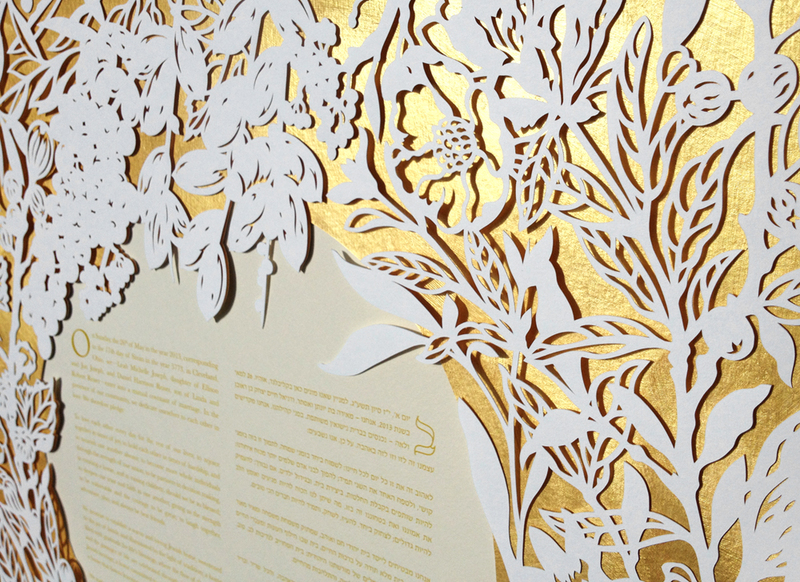 We have been extraordinarily blessed to have Naomi create an exquisitely beautiful bespoke ketubah that will hang in our home for the rest of our lives. Thank you, thank you, thank you. Absolutely beautiful work! And such a cute couple!